This week is National Grilling week, and the grill gurus at George Foreman sent me a massive combined grill and griddle to cook a meal for 4 with a budget of £30. I came in under budget with enough money left over for some ice cream. This dish is both delicious and very easy to cook, apart from marinading the meat, all the prep is done whilst the grill is heating up. The George removes most of the fat from the chicken leaving tender juicy meat beneath crispy skin. The remains of the marinade is cooked with the peppers making them sweet and sticky. Grilling the lemons intensifies the flavour. The George Foreman grills, or Georges as they seem to be universally known as, are very effective and grilling and removing fat – I was fascinated and slightly repulsed in equal measure by the amount of fat that had dripped from my chicken pieces into the fat drip tray (and most glad I would not be consuming it). 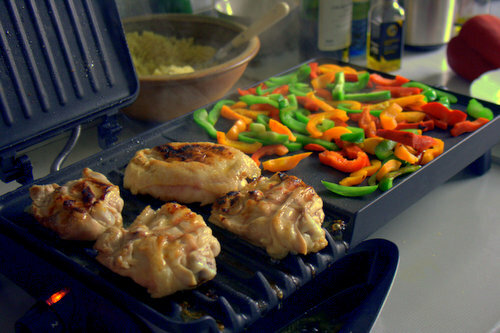 Although huge, I was really impressed with the grill, perfect for entertaining and for cooking on in front of friends. I imagine it would be great on an extension lead outside to supplement the BBQ. If you do not have a grill, cook the chicken on a cast iron griddle on the hob (cooking times will be longer) and use a frying pan for the peppers. To see what other bloggers came up with for their £30 budget check out the George Foreman Facebook page, and vote for your favourite recipe. The only prize is the creator of the top recipe will be crowned King of the Grill! I love Katie’s Sticky griddled plums and pancakes, and very impressed that Gary made an entire Sunday grill (as opposed to roast) on his George. 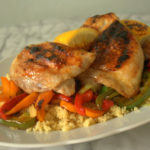 If you try this Recipe: Lemony Maple Chicken Thighs with Sticky Pepper Cous Cous please tag #FussFreeFlavours on Instagram or Twitter. It is amazing for me when for me when you make one of my recipes and I really do love to see them. You can also share it on my Facebook page. Please pin this recipe to Pinterest too! Thanks for reading Fuss Free Flavours! At least 4 hours before you want to eat marinade the chicken. Simply whisk together the maple syrup, soy sauce and lemon juice, place the chicken thighs in a non metallic dish and pour the marinade over. Cover and put into the fridge. (You can freeze the chicken in the marinade too). 15 minutes before you want to eat turn the gill on to heat. Whilst it is heating up prepare the cous cous by placing it into a bowl, then pour 1.25 times its volume of vegetable stock over. Add the olive oil, stir and set to one side. Slice the peppers into thin strips and shred the spring onions. Place the chicken thighs on the grill and put the lid down on them. Pour a few drops of oil onto the griddle and then cook the peppers on it, gently moving them around to prevent them burning. Depending on size, the chicken thighs will take between 8 - 12 minutes to cook. Half way through cooking time flip them over, put the lemon quarters onto the griddle between them . Pour the remains of the marinade over the peppers, and add the spring onions and cook until sticky and starting to blacken. Fluff through the cous cous with a fork and heap onto a serving plate. 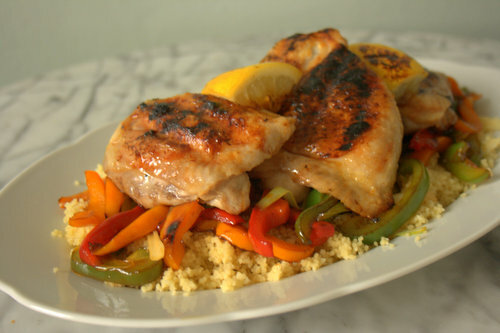 Top with the sticky peppers, chicken and lemon.